The GMR 18 brings you the power of X-band digital marine radar scanning like never before. GMR 18 is a 4 kW radar with 36 nm range. At 0.45 m in diameter, it is twice as powerful as most other radars in its size and price range. Combine that with the antenna's 5 degree beamwidth, and you're looking at the best weather penetration and target definition in its class. To help you avoid traffic on the water, the GMR 18 provides MARPA target tracking, which allows you to track the bearing, course, speed and predicted closest approach of up to 10 targets. And like all Garmin radars, GMR 18 has self-contained signal processing, which provides you with a more precise, easy to read signature. 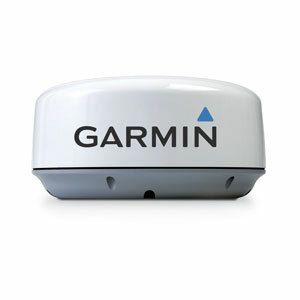 The GMR 18 transmits data over the Garmin Marine Network, a 100 MB plug-and-play proprietary network that gives you the ability to expand your boat's system as needed. Once connected to the network, you can use any network-compatible Garmin chartplotter as your radar screen. And as an aid to locational awareness, you can overlay the GMR 18 radar image on the chartplotter's map page. You also can split the on-screen display so that you can view the map and the standard radar page simultaneously.